Packed with rustic beauty and romance, Hanoi is a regularly progressing city with narrow streets of old quarters and modern metropolis. With colonial past, one can witness its shadow lurking all over the city through its colonial-style buildings and museums. Commonly referred as Saigon, Ho Chi Minh City is all about dynamism, crowded streets, skyscrapers and urbanization fusing well with culture side including Oriental style pagodas, ancient temples and traditional markets. Halong Bay is a popular bay which is located in the north of Vietnam. The name of this place i.e. Halong means "the place of descending dragons'. This place was not very much known before the 19th century. However in the recent years the popularity of this place has risen to a much greater value. Hoi An is one of the oldest cities located all over Asia. This city has been known to be around 2000 years old. This city is known to be established in the 15th century and is now declared as the world heritage site by UNESCO. Dan Nang is the third largest city in Vietnam by population. Popularly known as the tourist capital of South-Central Vietnam, this place is filled with beaches, museums, evolving nightlife and world class infrastructure. Hue city is one of the oldest cities in the history of Vietnam. This city was once the capital of Vietnam and has seen pretty tough times. Although not completely surrounded by the rivers this city in Vietnam does sure contain some wonderful beaches. Sapa is one of the popular hill stations located in Vietnam. Situated at a height of 1500 metres Sapa is known to share border with China. This popular destination is favourite amongst the tourist for its high cultural diversity as well as scenic beauty. Nha Trang is one of the most famous tourist spots located in the country of Vietnam. This city is known to be situated along the coast lines and is known to contain abundant sea animals as well as aquatic life. Rich in natural landscapes and myriad historical destinations, the province of Ninh Binh is a traveller's dream come true. One of the oldest provinces of Vietnam, this destination has something on its plate for every breed of traveller. Da Lat is a typical tourist destination located in the southern central highlands of Vietnam. Because of its pleasant weather around the year, people show up all the time seeking summer respite from beaches and lowlands. The picturesque town of Mui Ne is situated a four-hour train ride away from the capital city of Ho Chi Minh. Perfect for beach lovers, this town is dotted with quaint fishing villages and azure sea waters. A unique feature of this place is that it houses sand dunes right next to the beach. Located at a distance of 240 kilometres from the city of Hanoi, Ba Be National Park is a quaint national reserve. Blessed with the bounty of rolling hills, plunging valleys, crystal lakes and mysterious caves, this landscape is a paradise for nature lovers. Con Dao is a group of islands lying off the southern coast of the country. There are a total of 15 islands of which Con Son is the largest and the only inhabited island. It served as the prison islands- first during French colonial era and later by the US supported South Vietnamese government. Somewhat isolated from the main city and braced against the Bac Lieu canal, Ca Mau, Vietnam's southernmost town is the perfect location if you want to drop off the earth and isolate yourself. 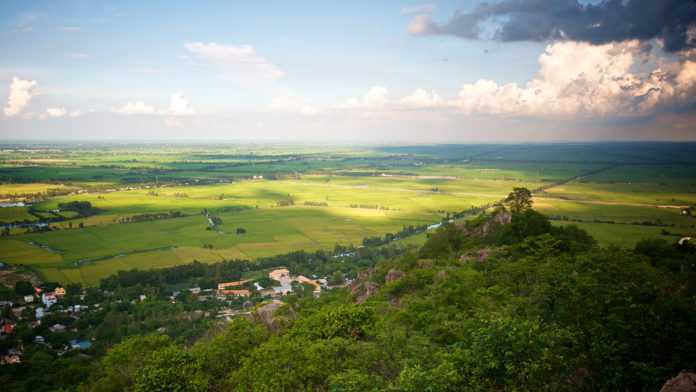 Nestled in the midst of sloping mountains and plateaus - this town offers you an opportunity to immerse yourself in the mystic scenery of the Vietnamese countryside. You can learn about the locals, go trekking, backpacking or just kick back and relax with a book and some local coffee. Mai Chau is the perfect location for tourists who want some peace and quiet. If you want to drop off from the earth and land in a richly cultural land, in the midst of nature, then Mai Chau is the place for you. Flanked by the highway, the ocean and the Da Rang River, Tuy Hoa is a sleepy and nondescript city that does not see many tourists. This quiet Vietnamese city is the perfect place to relax, catch some waves or intent with friendly locals who are more than welcoming of tourists. As you first approach Vung tau, two spectacular mountains greet you. When you move in further you realize that these mountains are surrounded by ocean on both sides. Phan Thiet is home to heated Sand Dunes, lush mountains filled with greenery, golden beaches with blue water and gurgling streams. A pleasant seaside city, with easy access to the Phong Nha Ke Bang caves, Dong Hoi is a rapidly rising tourist destination. Haiphong is an industrial city and you can feel it in the air as soon as you enter. However, Haiphong also offers you with hidden relaxation, tucked and hidden away in the industrial town. It has number of beaches and markets in addition to historical structures and pagodas and even a museum. Lao Cai offers you a picturesque scenery, adventure and a peek into the rich culture and history of the local people, serving as an excellent tourist retreat for all kinds of people. Hoa Binh is the Capital City of the Hoa Binh province of Vietnam. Located but a short distance from Hanoi, this hidden gem offers spectacular natural beauty, coupled with a rich culture. The natural beauty, rich history, and unique culture have made Hoa Binh a tourist attraction. Bai Tu Long Bay, located a mere 30 km from Halong Bay is its sister in every sense. The untouched limestone and karst rocks remind you of Ha Long before it was overrun by tourists. The bay spans a vast expanse of oceans with numerous islands made of limestone karst. Nestling on the very edge of Vietnam, Mong Cai is a small town located on the Vietnam-China border. It is filled with picturesque untouched beaches and a rich history of the Vietnam-China conflict. Son La is a Vietnamese town hidden amidst towering mountains. The town has a dark past as it played house to one of the most brutal prisons in the world. Today, all that remains is the ruins and a tiny town with ghosts of its past deceptively hidden behind its natural rivers, trees and flowers.